HSR trains running between Nanjing, Shanghai and Hangzhou will see timetable changes beginning 15 May 2012. 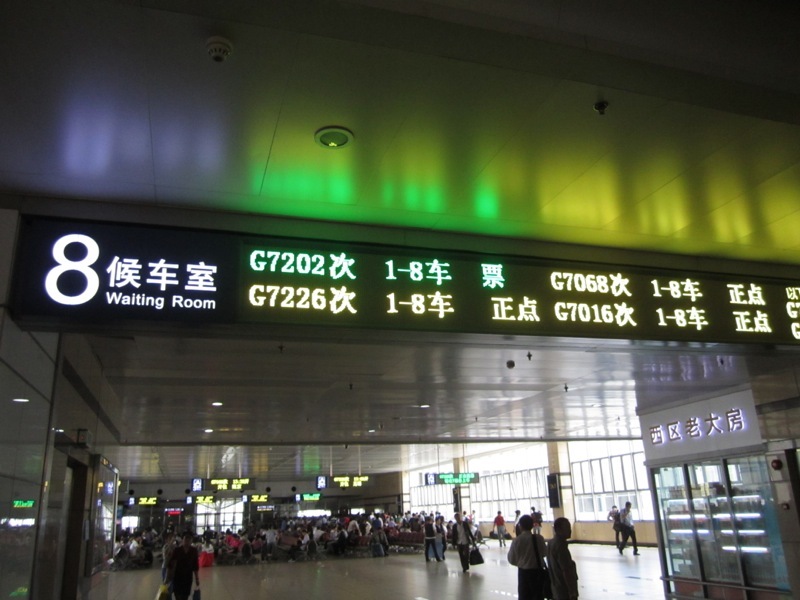 The Shanghai Railway Administration has announced on 08 May 2012 a series of changes to trains running between Nanjing, Shanghai and Hangzhou. A new D train (lower fares, but also lower speeds) — Train D5669 — will run between Shanghai Hongqiao and Hangzhou. Train D5462/D5463 from Hefei will also get services extended to Hangzhou, and will now carry train numbers D5666 and D5667. A host of other minor changes have also been made. Train G7082 from Shanghai to Nanjing South will make an extra stop at Huishan (ar 20:28, dp 20:29). Times of arrival and departure will change for Changzhou (ar 20:39, dp 20:40) and Danyang (ar 20:56, dp 20:58). The train will now arrive at Nanjing South at 21:33. Train G7301 from Shanghai Hongqiao to Hangzhou will no longer stop at Haining West, but will instead stop at Jiaxing South (ar 07:31, dp 07:33). The train will arrive at Hangzhou at 08:04. Train G7305 will now arrive at Hangzhou at 09:51. Train G7306 from Hangzhou to Shanghai Hongqiao will make an extra stop at Jiashan South (ar 09:33, dp 09:35). The train will now arrive at Shanghai Hongqiao at 09:56. Train G7308 will now arrive at, and depart from, Jiaxing South (ar 10:29, dp 10:30) on a new schedule. It will now arrive at Shanghai Hongqiao at 10:55. Train G7315 from Shanghai Hongqiao to Hangzhou will make an extra stop at Songjiang South (ar 14:14, dp 14:15). It will now arrive at Hangzhou at 14:55. Train G7321 from Shanghai Hongqiao to Hangzhou will make two extra stops, one at Jiaxing South (ar 17:25, dp 17:26) and another one at Haining West (ar 17:41, dp 17:42). Due to this, the train will now arrive at Hangzhou at 18:01. Train G7323 from Shanghai Hongqiao to Hangzhou will now make an extra stop at Tongxiang (ar 18:38, dp 18:40), with the train now arriving at Hangzhou at 19:03. Train G7325 from Shanghai Hongqiao to Hangzhou will make an extra stop at Jinshan North (ar 19:17, dp 19:18). Times will change when the train is at Jiashan South (ar 19:31, dp 19:33) and Hangzhou (ar 20:03). Train G7331 from Shanghai Hongqiao to Hangzhou will no longer stop at Tongxiang, but will stop instead at Jiaxing South (ar 07:03, dp 07:05). Train G7332 from Hangzhou to Shanghai Hongqiao will now make an extra stop at Tongxiang (ar 09:04, dp 09:05). The train now leaves Hangzhou at 08:35 and arrives at Shanghai Hongqiao at 09:43, and will arrive and depart Yuhang (08:51 ar, 08:52 dp) and Songjiang South (ar 09:27, dp 09:29) on a new schedule. Train G7333 from Shanghai Hongqiao to Hangzhou will make an extra stop at Songjiang South (ar 07:46, dp 07:47). Due to this, the train will now leave Shanghai Hongqiao at 07:32. Train G7334 from Hangzhou to Shanghai Hongqiao will no longer stop at Jiaxing South, but will instead stop at Haining West (ar 09:37, dp 09:39). Train G7339 from Shanghai Hongqiao to Hangzhou will no longer stop at Haining West, but will stop instead at Tongxiang (ar 12:14, dp 12:16). The train now leaves Shanghai Hongqiao at 11:37 and arrives at Hangzhou at 12:41, and will arrive and depart Jiashan South (ar 11:58, dp 11:59) on a new schedule. Train G7347 from Shanghai Hongqiao to Hangzhou will make an extra stop at Jiashan South (ar 17:01, dp 17:03). It will now stop at Jiaxing South on a new schedule (ar 17:12, dp 17:14) and will arrive at Hangzhou at 17:43. Train G7351 will now leave Shanghai Hongqiao at 18:18. Schedules have changed for this train at Jiashan South (18:39 ar, 18:41 dp) and Haining West (ar 19:00, dp 19:02), and it will now arrive at Hangzhou at 19:21. Train G7368 from Hangzhou to Shanghai will no longer stop at Jiaxing South, but will stop instead at Haining West (ar 20:24, dp 20:25). It now arrives in, and departs from, Tongxiang at new times (ar 20:34, dp 20:35). Train G7381 from Nanjing to Hangzhou will make an extra stop at Jinshan North (08:54 ar, 08:55 dp). Times of arrival and departure have changed for Shanghai Hongqiao (08:32 ar, 08:36 dp), Jiashan South (09:04 ar, 09:05 dp), and Jiaxing South (09:14 ar, 09:16 dp), and the train will now arrive at Hangzhou at 09:45. Train G7383 from Nanjing to Hangzhou will now make an extra stop at Songjiang South (ar 10:01, dp 10:02). The train will now arrive at Shanghai Hongqiao at 09:44, and depart the station at 09:46. Train G7384 from Hangzhou to Nanjing will no longer stop at Jiashan South, but will stop instead at Jiaxing South (ar 10:43, dp 10:44). Train G7385 from Nanjing to Hangzhou will now make two extra stop, one at Jiaxing South (ar 14:22, dp 14:31) and Yuhang (ar 14:55, dp 14:56). Times of departure and arrival have changed for this train at Jiashan South (ar 14:12, dp 14:13) and Haining West (ar 14:46, dp 14:47). The train will now arrive at Hangzhou at 15:12. Train G7391 from Shanghai Hongqiao to Hangzhou will no longer stop at Yuhang, but will stop instead at Tongxiang (ar 14:52, dp 14:54). Times of departure and arrival have changed for this train at Jiaxing South (ar 14:39, dp 14:41). The train will now arrive at Hangzhou at 15:17. Train D91 from Shanghai Hongqiao to Nanchang will change its times of arrival and departure for Tongxiang (ar 17:10, dp 17:11) and Hangzhou South (ar 17:47, dp 17:57). Train D3201 from Shanghai Hongqiao to Xiamen will now leave Shanghai at 08:05. Train D5431 from Xuzhou East to Wenzhou South will no longer stop at Danyang North, but will now stop at Suzhou East (ar 08:45, dp 08:47) and Dingyuan (ar 09:33, dp 09:35). As a result, schedules for this train have changed at Xuzhou East (dp 08:25), Bengbu South (ar 09:13, dp 09:15), Chuzhou (ar 09:54, dp 09:56), Nanjing South (ar 10:15, dp 10:17), Changzhou North (ar 10:52, dp 10:54), Wuxi East (ar 11:12, dp 11:14), Suzhou Norht (ar 11:25, dp 11:27), Kunshan South (ar 11:39, dp 11:41) and Shanghai Hongqiao (ar 11:59, dp 12:06). Please note that Suzhou East and Suzhou North stations are in two different cities far apart from one another! Train D5482/D5483 from Cangnan to Lu’an will no longer stop at Tongxiang, but will stop instead at Jiaxing South (ar 12:01, dp 12:02). Train D5553 from Shanghai Hongqiao to Wenzhou South will now make an extra stop at Yuhang (ar 08:13, dp 08:26). It now leaves Shanghai Hongqiao at 07:11. Schedules for this train have been changed at Jiashan South (ar 07:37, dp 07:39) and Tongxiang (ar 07:57, dp 07:59). Train D5590 from Wenzhou South to Nanjing will no longer stop at Huishan, but will stop instead at Tongxiang (ar 18:46, dp 18:47) and Wuxi East (ar 20:24, dp 20:25). Schedules for this train have been changed for stops at Songjiang (ar 19:16, dp 19:17), Shanghai Hongqiao (ar 19:33, dp 19:37) and Wuxi (ar 20:33, dp 20:35). Train D5600 from Ningbo East to Hangzhou will now arrive at Hangzhou at 09:49. Train D5651 from Shanghai Hongqiao to Yiwu will no longer stop at Jiaxing South, but will now stop at Tongxiang (ar 07:23, dp 07:25). Train D5661 from Nanjing to Jinhua West will no longer stop at Jiaxing South and Jinshan North. Schedules for this train have changed at Nanjing (dp 06:22), Zhenjiang (ar 06:45, dp 06:53), Danyang (ar 07:06, dp 07:08), Changzhou (ar 07:23, dp 07:25), Wuxi (ar 07:40, dp 07:42), Suzhou (ar 07:58, dp 08:00), Kunshan South (ar 08:12, dp 08:27), Shanghai Hongqiao (ar 08:45, dp 08:47), Jiashan South (ar 09:20, dp 09:29), Yuhang (ar 09:52, dp 09:53) and Hangzhou (ar 10:12, dp 10:17). Train D5665/D5668 will see changes in schedule at Haining West (ar 19:34, dp 19:36) and Yuhang (ar 19:44, dp 19:52). Train D5689 from Shanghai Hongqiao to Quzhou will no longer stop at Yuhang, but will now stop at Haining West (ar 07:41, dp 07:50). The train now leaves Shanghai Hongqiao at 06:48 and arrives at Jiaxing South (ar 07:19, dp 07:21) and Hangzhou (ar 08:10, dp 08:16) at new times. Also, Train T31 will now arrive at Hangzhou at 08:42, with effect from 14 May 2012. These changes are minor but do affect a lot of trains. As Chinese HSR trains also have a habit of leaving stations early, be sure, then, to arrive at your station well in advance!